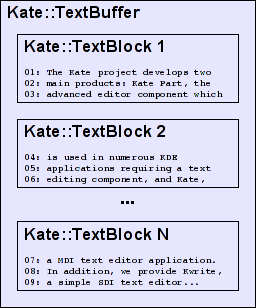 Those editing primitives are implemented in the Kate::TextBuffer and Kate::TextBlock and take care of balancing the text blocks. 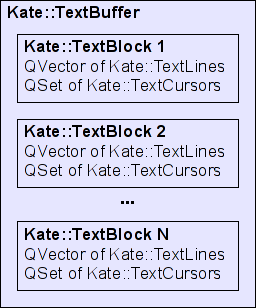 For each one the set of text cursors in a text block has to be adapted. Of course, corner cases need to be taken into account: For instance, unwrapping the first line in a text block means that cursors in the first line need to be moved to the previous text block. All editing primitives emit a signal, such that additional layers later can track what happens. For instance, the undo/redo system needs to know all editing operations. Or on top of that we could implement vim like swap file support, i.e., track all changes from the beginning, and if Kate crashes, replay all the editing primitives on the original files. Transactions. A transaction consists of several of the four editing operations. For instance, if you select text and then move it to another location in the document with drag & drop you want this to be grouped together to a single text operation on undo/redo. (The text operations in this case are unwrap lines and remove text, then insert text and wrap line). To be able to specify which parts of text operations belong together, the text buffer provides two functions: startEditing() starts a transaction and finishEditing() closes it. Those functions use reference counting, so you can call startEditing() multiple times and only the last finishEditing() completes a transaction. Again, signals are emitted e.g. in finishEditing() such that other layers (undo/redo system) are notified about this. Revisions. As an easy way to check whether a document changed you can get the current revision of the text buffer. The revision is simply an int64 starting with 0 after loading a document. The revision is incremented in every of the 4 editing primitives. This way you don’t have to listen to multiple signals like textInserted() and textRemoved(). This could be useful for e.g. KDevelop’s background parser: Parse a file. When done, check whether the revision is the same. If yes, parsing was successful. If not, parse again. This is how QtCreator does it. Easy and straight forward. Unit Tests. The text buffer, text block, text line, text cursors are all designed such that unit tests can be written. Hence, each of the above implementation details will be covered by unit tests. Vim like swap files: If Kate or the application using Kate Part crashes, the unsaved data in the text document is lost. Vim has a backup mechanism called ‘swap files’ to recover from crashes to avoid data loss since years, and it works as follows: Each of the 4 editing primitives explained above are streamed into a separate file. When you save a file successfully, the swap file is cleared. If a crash happens, vim loads the original text document and then replays all editing operations in the swap file. This way the current unsaved editing state is recovered; no data is lost. Since the text buffer emits all necessary signals, implementing this feature is kind of trivial. Any takers? Right now, the highlighting works in an extra class, accessing the text buffer’s text lines and setting the text attributes such as the color. As idea, we could also derive a class Kate::HighlightingBuffer from Kate::TextBuffer and do the additional modifications in the derived class instead of an extra class. We’ll have to see whether that makes sense. checkout the code base, clone it, create branches, and merge back! 1. QTextDocument's API doesn't fit what all other parts of the Kate component use, to wrap it into a compat API or to change all other parts would be kind of throwing all code away and rewritting it from scratch. We tried that once, years ago, but at that time QTextDocument had it's own issues and now I guess it is just to late to redo all that work. 2. Same here, the component wants a line based api, it wants to get lines as datastructures and pass them around. This is only feasible if the stuff is stored as lines, too, or by copying the data on line retrieval. I stick to line storage atm. For the question about to break long lines down: Won't be done. They need to be layouted at once anyway, I don't consider text files with > 10k columns to be really the place to use a normal text editor, for html pages which remove the line break, we will give the possibility to just let kate part auto-wrap them hard.